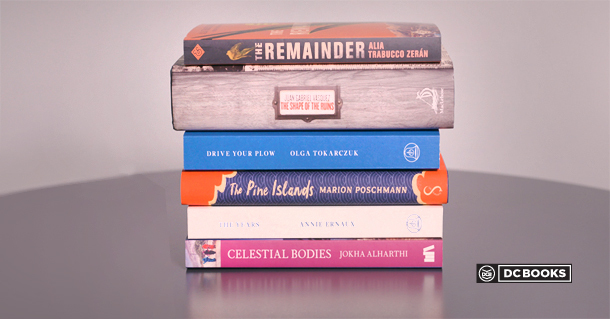 The Man Booker International Prize which celebrates the finest works of translated fiction from around the world has announced the shortlisted books for the 2019 prize. The list this year features five women authors and an all-female cast of translators. Trimmed down from a list of 108 books in twenty-five languages, the shortlist comprises of six books in five languages which include Arabic, French, Spanish, German and Polish translations. The prize established in 1969 has never seen this sort of a female dominance, which is considered “a very happy byproduct of ungendered discussions” as quoted by Betty Hughes, historian and the Chair of the panel of judges. The list of books include The Celestial Bodies by Jokha Alharthi translated from Arabic by Marilyn Booth, The Years by Annie Ernaux translated from French by Alison Strayer, The Pine Islands by Marion Poschmann translated from German by Jen Calleja, Drive Your Plow Over the Bones of the Dead by Olga Tokarczuk translated from Polish by Antonia Lloyd-Jones. The two Spanish novels running for the prize are, The Shape of the Ruins and The Remainder by Juan Gabriel Vásquez and Alia Trabucco Zerán respectively. Olga Tokarczuk, who won the prize for the novel Flights last year is up for the prize this year with Drive Your Plow Over the Bones of the Dead. The Years by Annie Ernaux has already won prizes including Prix Renaudot in France and Premio Strega in Italy. The winner of the Man Booker Prize receives £50,000, while each of the shortlisted authors is awarded £2,500. The shortlist was selected by a panel of five judges, chaired by Bettany Hughes, an award-winning historian, author, and broadcaster, and is made up of the writer, translator, and chair of English PEN Maureen Freely; philosopher Professor Angie Hobbs; novelist and satirist Elnathan John and the Indian essayist and novelist Pankaj Mishra.